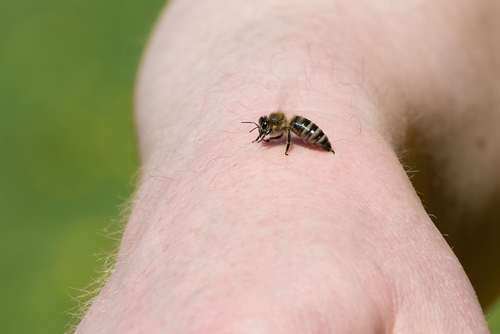 We’ve all experienced the discomfort of a wasp or bee sting at some point during our lives. But while most of these stings won’t cause any lasting damage, they are one of the most common causes of medical problems – especially as summer starts. Wasps and bees are both insects from the Hymenoptera order, and their stings can result in serious reactions, ranging from localized swelling and pain all the way to anaphylactic shock, or worse. Fortunately, knowing how to identify stinging insects could help you avoid any unpleasant run-ins with them. Here, we’ll describe 5 common species of wasp and bee so you can spot them and protect yourself from their stingers. The sweat bee is attracted to the salty taste of human perspiration. That means if you spot one of these tiny bees, the worst thing you can do is to start panicking and sweating. Sweat bees are common throughout most parts of the world, with around 1,000 types in total. Often, these bees will only attempt to sting you if you try to remove them from your skin, and only the females can sting. A sting from a sweat bee causes a spark-like sensation, measuring 1.0 on the Schmidt Pain Index. The yellowjacket is an aggressive species of wasp found across the globe. They’re named after their distinct black and yellow markings, and often live in large colonies that construct nests in dense bushes and trees. What makes yellowjackets so dangerous is that they can attack in swarms if they feel threatened, stinging their victims repeatedly. A single sting from a yellowjacket is painful and can cause victims to become hypersensitive to their stinger, putting them in danger for future encounters. The Schmidt Pain Index Rating for yellowjackets is 2.0. The honey bee is a rather productive pest, known for creating wax and honey. These bees live in colonies like yellowjackets, and attack when they feel threatened. The bee dies after an attack, as its stinger is attached to its internal organs, which rip out as it attempts to fly away. But even after the death of the honey bee, the stinger will continue to work its way deeper into the victim’s skin. That means it’s essential to remove the stinger as soon as possible. A sting from a honey bee has a pain scale rating of 2.0. Paper wasps build their nests in a way that makes them look like they have been constructed out of paper. These wasps are not usually aggressive and try to avoid human contact. Unfortunately, when a paper nest is built in a person’s home, these wasps are very likely to be disturbed and pose a serious threat. A sting from a paper wasp creates a burning sensation on the skin’s surface, earning it a 3.0 rating on the Schmidt Pain Index. The tarantula hawk is perhaps the most terrifying wasp in the insect kingdom. It’s sting is the most painful in the world, affecting verbal and physical coordination. Tarantula hawks are commonly found in Southeast Asia and Africa, but they can live in the southern states of America, too. In fact, these dangerous creatures are the official state insect of New Mexico. The stinger of a tarantula hawk can be up to 1/3 inches in length, and the pain of the sting is unbearable, lasting for around 3 to 4 minutes. On the Schmidt Pain Index, a tarantula hawk sting measures at 4.0. One of the best things you can do to avoid getting stung is to avoid bee and wasp nests. Unfortunately, if any kind of stinging insect has built its nest near or on your property, it will be much harder for you to stay away. If you notice any of the insects we’ve mentioned above around your home, it’s crucial to seek immediate help from an expert, who can either relocate or destroy the infestation as necessary. Contact Adios Pest Control today to protect your family from bees and wasps.